Di Russell-Horn Creates Art from the Heart, Creativity for the Soul, and Tranquility for the Mind. I love jewelry, I live, eat and breath it. my creativity and my spark. with many challenges that I have faced and conquered. there are nothing left inside of me to give. my mojo is back and I cannot get enough! I find myself dreaming about designs and techniques. 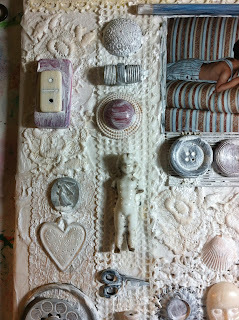 spiritual ephemera and found objects. I do love my gemstones and truly believe in their meanings. When I wear certain stones, I feel the power of them. gemstones has become an obsession with me. The dirtier my hands get, the happier I am. coupled with the natural gemstones is a perfect marriage. and not for everyone, but I still follow my muse. more traditional and appeal to the masses. So, for now, I do both. to be with me until I can solve the issue. that appeal to a variety of woman. My hope is to be able to get my pieces in a forum where they can be sold. couple of weeks, just in time for the holiday season. Stay with me as I post various techniques and working through designs. I look forward to having my mojo back and sharing with you. I love jewelry, plain and simple. I love designing it, creating it, and wearing it. I love learning new techniques, I love reading about them, sketching and planning and then incorporating them into my designs. I love the way old rusty metals feel in my hand as I turn them over, imagining what a hammer and torch can do to transform them. . 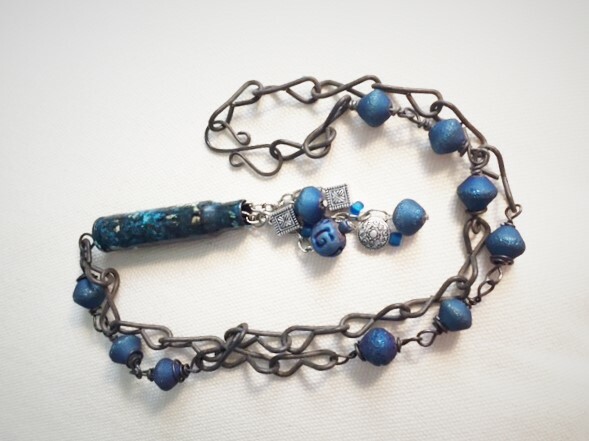 I love the way a vintage rosary shimmers in the sunlight, paying homage to those who lovingly prayed with it and I want to continue its healing powers in a new design. 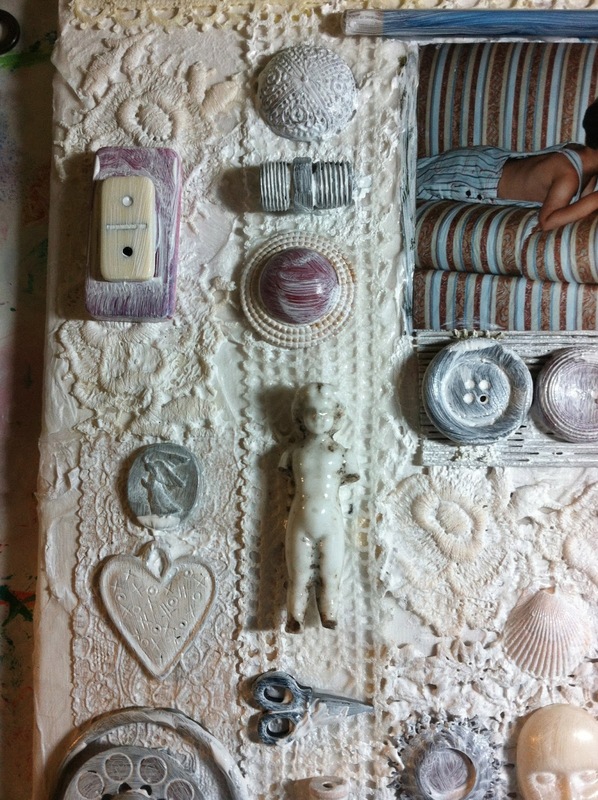 I love the way found objects can bring me back to my childhood, bring me back to a quieter, less hurried time, always thinking about where in my art, I can incorporate them. I love inspirational words, quotes and books, they move me and make me realize how fragile life is and how important it is to look beyond hurt and pain, to life being innately good. I love the beach. I am an ocean girl, finding my happiest times listening to the gentle, rhythmic sound of the ocean, whether I am sitting with my toes in the sand or near my ocean sound machine in my studio. I love water and sun and sand. I find my most creative thinking is done with one or all of these elements. I love the process of creating jewelry, letting pieces speak to me and lead me where the creation should go. All of this had brought me to where I am today, living my life and creating inspirational jewelry. My hope is that my jewelry will inspire you, will give you courage when you need it and bring you happiness and peace. This is my love and life, Sixth Floor Designs. and making homemade shimmer spray paints. When our hearts are breaking and our mind cannot wrap around a tragedy I turn to art to help me cope. In the aftermath of the Sandy Hook killings in New Town, Ct. I had to keep my hands busy as I watched the news unfold. 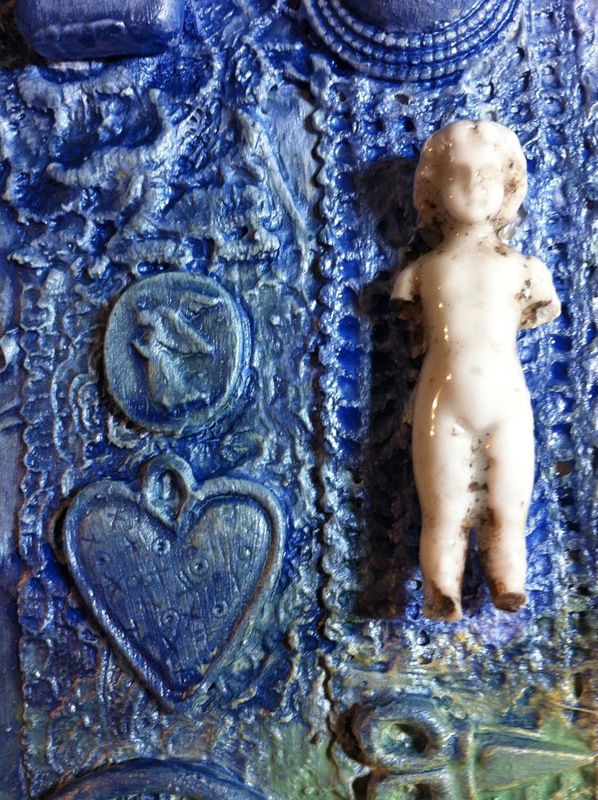 I wanted to share this piece of art that I created, entitled "Innocence", in honor of the children who lost their lives and the heroic teachers who died trying to save them. It started out as "just a piece of art", then took on it's own life as it evolved into a piece related to the horrific tragedy that we all watched unfold. I always work intuitively and let a piece of art guide me to what it wants to do. It wasn't until "Innocence" was done and hanging on my wall, that I realized I had placed 26 found objects on the canvas. I started by taking a 12x12 canvas and applied a coat of Gesso. I LOVE gesso. It's a chalky paint that gives the canvas "tooth" and opaqueness (is that even a word?). I then started scrunching up tissue paper and painting it onto the canvas with a matte gel medium (a great adhesive) and a sponge brush. 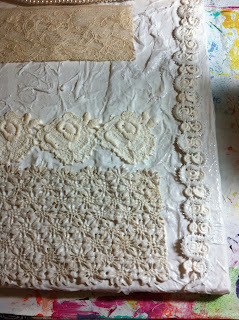 Once that was dried, I added pieces of lace and vintage textiles and covered most of the canvas. 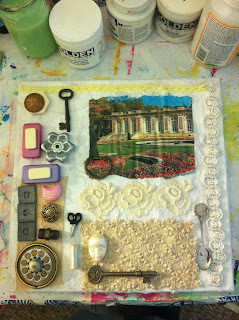 I pulled out a variety of ephemera and found objects and started to lay them out until I have a pleasing arrangement. 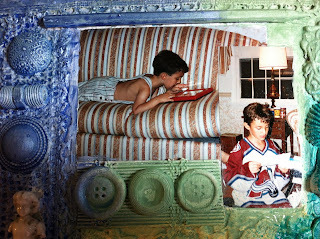 I kept changing up pictures and found objects until it felt right. 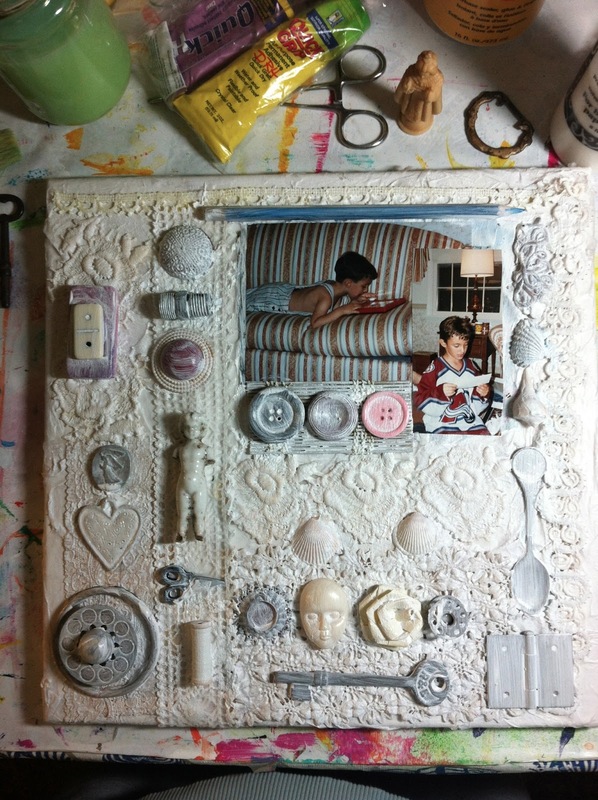 I used buttons, old earrings, charms, hardware, flowers, pictures of my son when he was 6 yrs old and anything that struck my fancy. This is where "collecting a little bit of everything" really pays off! 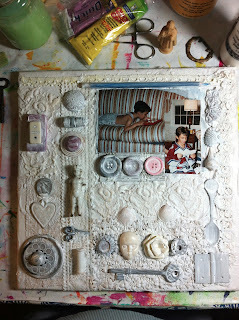 I used a Heavy Gel Medium (Golden) to adhere all of the components and let them dry overnight. Then I took out my gesso and coated the canvas with 2 coats to unify everything. with a damp paper towel and painted around it. I love shimmery spray paints but they are so expensive. I had found through one of my online groups, how to make homemade shimmer paints. Buy small spray bottles ( I got mine at Hobby Lobby). I used the 2 oz ones. Then add to the spray bottle, acrylic paints (the cheap ones work well, I love the metallics),about 2-3 teaspoons, a good dollop of glue (white glue or Modge Podge), a teaspoon or so of Pearl Ex or Perfect Pearls (for a beautiful shimmer) and fill the bottle with warm water. Gently shake up and viola, you have your own homemade shimmering spray paints!! Now comes the tricky part, spraying the canvas. 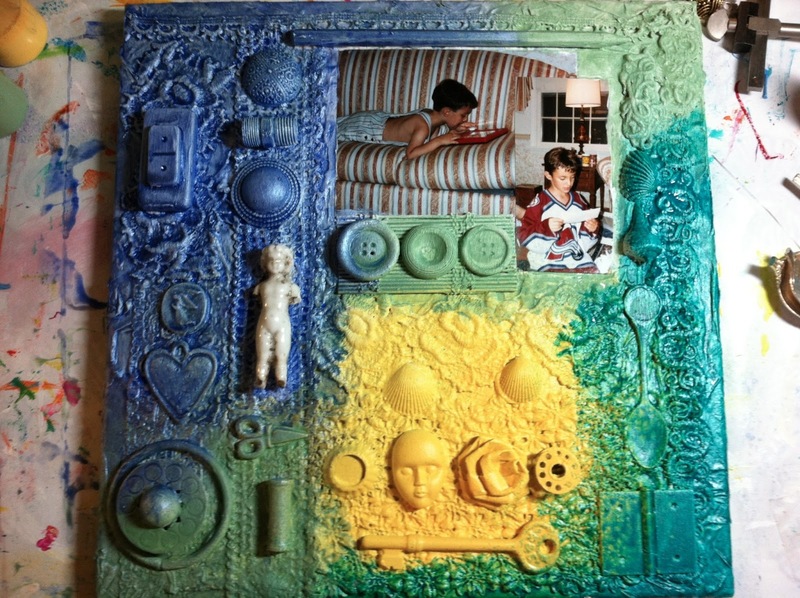 I first covered anything I didn't want painted (the pictures of my son Brian and the frozen charlotte), with damp paper towels. I started with the lightest color (yellow) and gently sprayed the canvas (I placed the canvas in a big cardboard box to contain the spray paint). I proceeded to spray the other colors. I love the shimmer of the paints and the way they blend into one another. I pulled out an old dictionary and found the definition of "innocent" and added that to the piece. It's been almost a year since my last post and so much has changed in my life. Most recently, the East Coast was hit hard with Hurricane Sandy last week. Rochester was very lucky, but not so much for our friends to the south of us in downstate New York and New Jersey. The devastation is unbelievable and so heartbreaking that people have lost everything, and those that still have a home, are either flooded out or have no power. I belong to an incredible group of artists that gather for retreats around the country, headed by two incredible women, one of whom is still without power and dealing with the aftermath of Sandy. These women who have created Art-Is-You Retreats have partnered with Family to Family to help the Hurricane Sandy Relief Effort. You can go to the link below, make a small donation of cash, gas cards, or grocery cards and help those who were not as fortunate as us. As you sit in your warm house tonight, with lights and TV on, say a little prayer for those who are still in the dark. Thanks!! Today is Thanksgiving! As always, I wake up early when I really could sleep in so I decide to do the responsible thing and get up to work on homework. I put on the coffee, opened all the blinds and put on the fireplace. The sun is rising before me and it is glorious. I have so much to be thankful for that I am overwhelmed with emotion and a deep peaceful contentment that all is well in my little corner of my world. 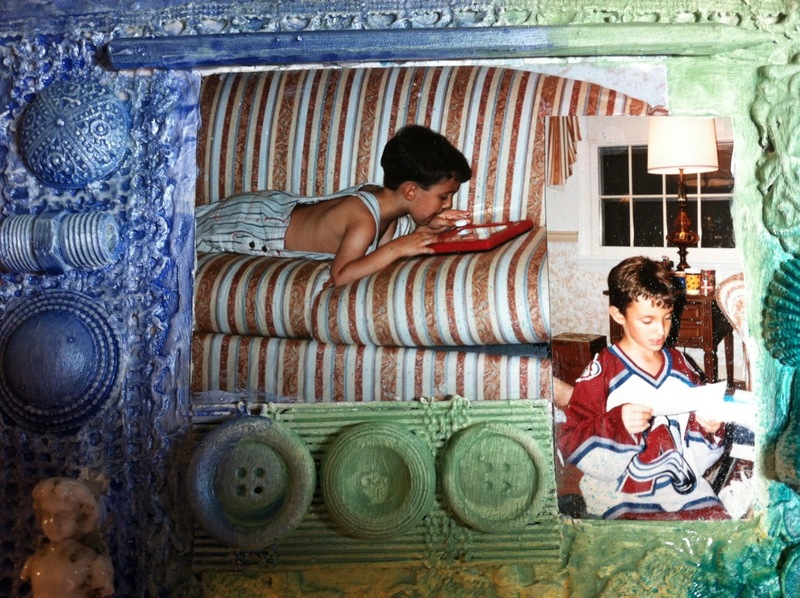 My son is sound asleep in his bed, which for any mom who has college children, knows the joy of having them home again. I have a job at Pluta Cancer Center where I work with wonderful people and have patients that are truly inspirational. On a daily basis I get to see the "big picture" and watch our patients beat cancer, go through treatment, somedays sick and other days with a smile on their faces. It is truly an honor to work there and humbling. I realize that my little problems and set backs in life are nothing compared to what others are facing. I thank God daily for my life, my work, my family and especially my friends. These last 7 months have been very challenging, out of work, on a tight budget trying to make ends meet, Brian living at school all summer, and me going back to school. Throughout it all, I could not have made it without the support of my friends and my family. Even Danny, my ex husband was there to lend moral support, a shoulder to cry on when I needed it, and genuinely caring about me. Today I thank God for my son, my family, for bringing our little Gianna (Chelsea & Matt Crawford's beautiful 4 month old little girl) into our lives, for my nieces who are pregnant and are bringing a baby girl and a baby boy into this world soon (for me to spoil of course), my new job at Pluta, for keeping Matt safe while he serves our country in Afghanistan, for my incredible friends, especially Garnet, Kara, Andrea and my Aunt Joyce, the women that love me unconditionally and are always there for me. I give thanks that I have a beautiful home, that I am warm, safe and healthy, that my aunt & uncle are in a home where they are well cared for and I don't have to worry about them 24/7. I give thanks for all the small pleasures in my life, my art, my artist friends through Art Is You and Suzi Blu, my health, and my life. I also ask the Lord to watch over our military, all those who are sick, those fighting cancer and other diseases, those on Hospice and their families, the families that are facing a tragedy right now, our children, our homeless, people in countries that are fighting for their freedom and rights that we take for granted in the US, and all those that need a little extra love and compassion. I am so thankful for my parents who are watching over me in heaven, for the values and morals that they instilled in me, and I in turn, instilled in my Brian. I miss them everyday and love them so much. So on this Thanksgiving, be thankful for all that you have and remember to say a little prayer for others that need help or watching over. Have a wonderful Thanksgiving and don't forget to wear your stretchy pants today!!! Well it's almost here!! 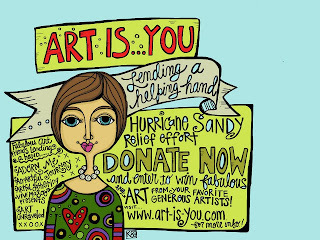 Art Is You...2011 in Danbury Ct starts next Thursday October 6, 2011. As you can see I'm in the midst of packing for the retreat. I'm teaching three workshops and taking two. 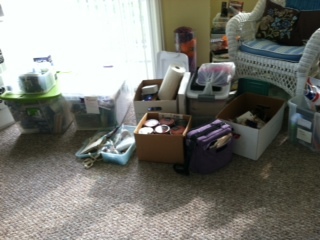 The bins are all lined up in the living room and I'm pretty much packed up for each class. The excitement level is just growing and growing. Through emails, our Yahoo Group and Facebook, everyone is so excited that it is finally here! The maiden voyage of the West Coast Art Is You just finished up this week in Petaluma, Ca. and was a HUGE success, thanks to Sallianne McClelland and Ellen Purtill-Legare, our fearless leaders. As always these ladies have a way of weaving their magic and creating an art event that is hands above any other retreats. They work long, hard hours to bring a host of fabulous teachers together with talented artists and it shows in the friendships that are forged and the excitement of everyone involved. So most of my art supplies are packed. Haven't given a thought to clothes yet but that will come this weekend. I'm taking two fabulous classes and I will have pictures to post when I get back. 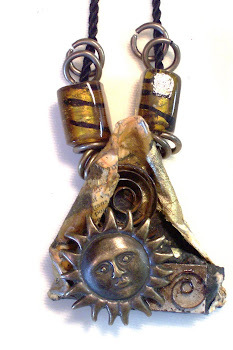 I'm teaching three wonderful workshops, The Art of Resin, Crocheting with Wire and Glass Beads, and Twisted Metals. I'll have lots of pictures to share and I'm sure some great stories. So if you aren't joining us this year at Art Is You, I'll bring back a little bit of the magic to share. The art event is held on Columbus Day weekend every year, so plan on joining us next year. The website is www.Art-Is-You.com . Next year there will be three retreats, Petaluma, Ca. , Danbury, Ct., and Sydney, Australia !!! Time to go finish packing! Take some time to create art today, I guarantee you will feel good! I am beyond excited!! 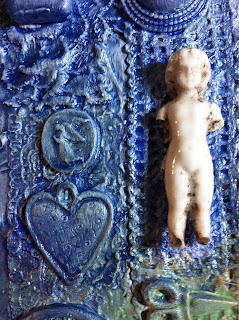 I just got word that I have been accepted to teach in 2012 at Art Is ...You (http://www.art-is-you.com/). I have been blessed to have taught there in 2009, 2010, and now in Oct of 2011. We have so many INCREDIBLE TEACHERS from all over the world (yes I did say world) that I was truly surprised and delighted to be asked to teach in 2012. Please check out our website, which includes a West Coast Art Is in September 2011 and (drumroll please.....) Australia in 2012!!! The talent of those who attend, whether teaching or taking is simply amazing, but the best part is the family atmosphere that Sal and Ellen have created. We are truly a family, welcoming newcomers with open hearts and arms. So please think about joining us either on the East Coast, West Coast or Down Under, I guarantee an experience beyond your wildest dreams! Learn how to turn raw metal into a permanent gorgeous patina with the help of household chemicals. A self taught mixed media artist,Di specializes in fiber arts, jewelry design, altered books, journals and mixed media art. She is always exploring new and inventive ways to use found objects. Di was recycling found objects long before “going green” became popular. She is currently teaching privately. She has previously taught locally in Rochester NY and at Art Is You in Stamford Ct. 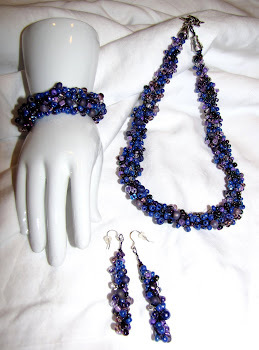 Her work can be seen in Belle Armoire Jewelry Issues.
" A Rose is a Rose"
Vingtage found objects, copper patina'd metals and lots of love"
The stillness of the early morning dawns in bold beautiful color. The most beautiful place to meditate in the morning.